I took a ton of pictures today. We went on a dolphin cruise and I managed not to throw up (though I think it really may be my last boat ride) The dolphins were cool and the pictures are okay, but in the end they were dolphins…you can picture it. I also had tons of swimming pictures. We got some swimming noodles and ben and nora are making some great progress swimming in the water….but my favorite pictures of the day came from the beach. 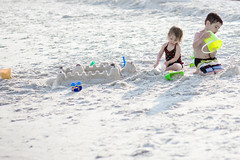 I asked jrh to make a sandcastle on the beach and after a short time both ben and nora were interested. I was happy to see them playing happily side-by-side – and there you have my photo of the day!